The Beautiful Susquehanna River Awaits! Camp Hebron is a beautiful place to canoe in PA, and explore miles of the West Branch of the Susquehanna River. They offer all sorts of options on trips that are sure to meet your needs! 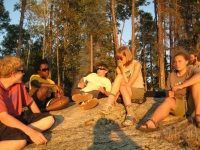 Their father/daughter trip and father/son trip are excellent ways to experience the joy of nature, and grow closer together all at the same time. The generally calm waters of the West Branch will give you plenty of opportunities to engage in your favorite water-based activities. 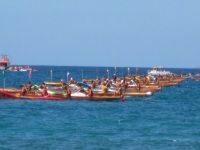 If you feel like having Camp Hebron take care of all of the arrangements for you, ask them about their Charter Canoes. All trips are scheduled on a first come, first serve basis, and don't forget the season is only open from April to August! Kittatinny Canoes has been paddling folks down the Delaware for over 71 years- that's three generations of service and experience! Nowhere else will you get this kind of breadth of marvelous river scenes; their trips encompass over 120 miles of the river through three states-New York, New Jersey, and Pennsylvania! 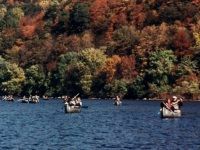 Kittatinny boasts "one of the largest fleets of canoes, rafts, kayaks, and tubes in the world"-and with their reputation and tradition, we believe them! You won't regret you visited Kittatinny as you float down the Delaware and appreciate the beauty of the river and the land around it, the same beauty that inspired the business to grow all those years ago. Their shops, campsites, and professionals, have everything you need to plan and supply your next trip canoeing in PA! The Pale Whale Canoe Fleet bills itself as the "premier canoe, kayak, and inner-tube rental" on the Clarion River in Cooks Forest. They have lots of different planned trips for you to explore the wonder of the Clarion, like their 4 and 10 mile trips (most taking only a few hours) over easy water- a perfect scenic view! If you're feeling a bit more adventurous, try a longer journey down the river where you can get some fishing in, and maybe see a bald eagle! 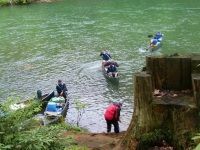 This is a great place for canoeing in PA; The Pale Whale makes renting a canoe to take downriver fun and easy! Group rates are available, so why not bring your friends and family to see the natural beauty of Pennsylvania? 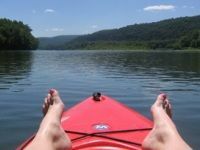 Come Paddle Down the Allegheny! Named by National Geographic as among the nation's "40 Great Fall Weekend Getaways," the Allegheny River in Northwestern Pennsylvania draws visitors from all corners of the U.S. every year. Indian Waters Canoe and Kayak in Warren County wants to outfit you so that you can better experience the river's natural beauty- they've been helping campers and canoers for over 20 years! Ask them about renting reliable, high-quality equipment, or about a guided tour down these majestic waters! You can paddle down just for the day, or you can camp in the lush forest near the riverbed for a two (or even three) day trip! Indian Waters offers you an experience canoeing in PA you'll never forget! One of the Best Places to Go Canoeing in PA! 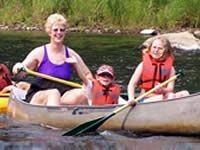 Eagle Rock, Inc. offers visitors to the Upper Allegheny a chance to experience its vibrant, natural beauty with a comfortable motel and the region's "best equipped and longest running canoe & kayak rental" right on the banks of the river! Why not call ahead, and let them handle all the hassle of planning your trip for you? They'll drive you up the river, prepare reliable equipment for you to use, and let you paddle back down the gentle waters. Best of all, service is affordable! Whether you want to stay the night, or just row the day away, they have a great value waiting for you at Eagle Rock, Inc. Endless Mountain Has the Experience to Supply You! Endless Mountain Outfitters has been supplying canoers on the Susquehanna River with reliable and affordable equipment for over ten years. You can depend on owners David and Melody Buck to have the experienced, friendly touch you need when planning your next canoe trip in PA! They'll help you plan your trip, and even let you book one of their Sugar Run cabins along the river where you'll be able to refresh yourself for another day's paddling down beautiful waters. This is a perfect place to take your friends and family on a little fall getaway, and experience the true beauty of untouched Pennsylvania wilderness- make Endless Mountain a part of your plans! Come and Explore the Youghiogheny River! 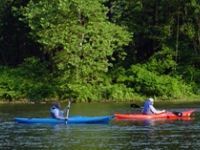 Yough Canoe Outfitters & Campground affords canoers of all skill levels a great opportunity to explore the natural beauty of the Youghiogheny River with safe, reliable equipment and available tent sites along the banks of the river. Reservations for half day trips are available, and overnight campers are always welcome! If this is your first time in a canoe, you'll have no problem navigating the calm waters of the Youghiogheny- it's waiting for you! Whether you want to rent a canoe for the day, or buy your own from their authorized dealers, Yough Canoe is happy to take care of all your needs! Take advantage of their affordable deals, and get out on the river today! Paddle over Famous Lake Erie! Port Erie Sports has everything you need to enjoy the sparkling waters of Lake Erie. 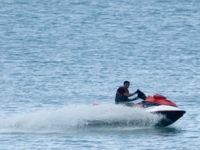 Located right on Presque Isle Bay, the shop has an entire fleet of water-sport equipment from boats to kayaks, to rod and reels to canoes! You'll love paddling out over the still water whether it's your first time out, or you've been canoeing all your life! The shop focuses on safety, and will always take the time to make sure you have what you need to have a secure, enjoyable trip. The next time you need a canoe rental on Lake Erie, why not ask the experts at Port Erie Sports? Outfitting Canoers for Over Thirty Years! 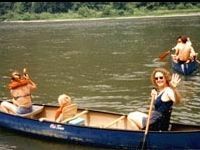 Chamberlain Canoes has been operating on the Delaware for over 30 years; they have the experience and customer-service-oriented approach that will make your next venture canoeing Pennsylvania the fun, secure experience it ought to be. This is a great place to launch your next day-trip (maybe with a picnic lunch) down this historic river, or even your multi-day camp-and-row get-together with friends. You pick the time you want to spend on the river, and Chamberlain Canoes makes it happen for you- and they're happy to do it! Come support a family operated business, and enjoy the beauty of Delaware all at once! Pack Shack on the Delaware River specializes in canoe rentals whether you're an expert looking for a bit of whitewater action, or a beginner looking to paddle for the first-time down a beautiful stretch of calm river. They have everything you need to venture out onto the Delaware, starting with reliable Coleman Ram-X® canoes, and including shuttle service to and from the river, as well as paddles, life-jackets, and a map of the river! Call for a reservation 48 hours in advance and receive a discount; bring friends with you and ask about their group rates! This is a great place for a PA canoe rental!